The possible dangers of soy foods have been the subject of a huge debate in the nutrition community for many years. Both sides of the controversy have strong arguments to support their positions. What do I think about soy? Well, the truth is - I find the issue very confusing. However, I prefer to err on the side of caution, rather than consume large amounts of potentially carcinogenic and endocrine-disrupting soy products. Moderation and common sense are needed here. Do Not Eat Non-Organic Soy Products! All soy that you consume should be organically grown because over 95% of soy crops are genetically engineered (GE) or genetically modified (GM or GMO). The most important health benefits of soy are related to its rich supply of isoflavones. Though soy contains many types of isoflavones, the most beneficial are genistein and daidzein. Soy and Breast Cancer: A 2007 study by the American Society of Clinical Oncology, demonstrated a strong association between higher levels of isoflavones in the blood and a lower risk for breast cancer. The strongest evidence for a decrease in risk was seen for the isoflavone genistein, suggesting that this compound may be the most protective against breast cancer development. There are indications that isoflavones may stop the growth of cancer cells by inhibiting DNA replication and reducing the activity of certain enzymes. Soy and Menopause: Studies of soy and soy isoflavones have shown them to be supportive of many symptoms and issues of perimenopause and menopause: weight loss; better regulation of insulin; improved bone health; better nail, skin and hair health; and decreased frequency and severity of hot flashes and night sweats. Information from the Women to Women website reveals that soy isoflavones, such as daidzein, can bond weakly to estrogen receptors and block the negative effects of excess estrogen. Conversely, when estrogen levels decline, isoflavones can 'stand in' for estrogen to help moderate the negative effects of low estrogen. Soy and Prostate Cancer: Several studies support the role of soy in the prevention of prostate cancer. There are also potential benefits in treating and slowing the progression of this cancer. Australian researchers found that men eating a diet rich in soy had a drop of 12.7% in prostate-specific antigen (PSA) levels, compared to the control group whose PSA levels rose 40%. Soy and Cardiovascular Health: Results of some studies demonstrated that a diet with significant soy protein reduces total cholesterol, LDL (bad) cholesterol, and triglycerides. The benefits of soy isoflavones may also include reducing the early stage of artery hardening (arteriosclerosis). Other studies suggest that isoflavone supplementation contributes to decreasing platelet accumulation, thereby reducing the risk of forming a blood clot that could lead to stroke or heart attack. So called 'side effects of soy' generally refers to symptoms of soy sensitivity or symptoms of soy allergies. When someone is sensitive to soy, it may mean they have insufficient digestive enzymes for completely digesting soy; or perhaps they have an imbalance of beneficial intestinal flora (bacteria) in their gut. Either can interfere with the breakdown of soy protein which can lead to bloating, gas, and intestinal inflammation. Often, digestive enzymes and/or probiotics can alleviate the sensitivity. Organic fermented soy bean foods are generally easier to digest. There are eight foods that cause 90% of food allergies and soy allergies rank lowest on that list. Many more people are allergic to eggs, milk products, wheat and peanuts. A true allergy happens when your body considers a substance to be foreign and creates an immune response against it. According to the Mayo Clinic, symptoms of soy allergies can include tingling in the mouth; hives, itching or eczema; swelling of the lips, face, tongue and throat, or other parts of the body; canker sores; wheezing, runny nose or trouble breathing; abdominal pain, diarrhea, nausea or vomiting; dizziness, lightheadedness or fainting. Anaphylaxis, a severe allergic reaction to soy, is rare. Symptoms are constriction of the airway with difficulty breathing, shock, and loss of consciousness. What are some of the many problems associated with soy infant formula? High levels of isoflavones in soy formula are potent anti-thyroid agents and may impair thyroid function. Phytic acid in soybeans block the uptake of essential minerals - especially zinc - in the intestinal tract and has caused a negative zinc balance in infants. Phytoestrogens are powerful endocrine disrupters that expose infants to up to 2,000 times higher estrogen content. Physical maturation in boys can be delayed, including lack of development of the sexual organs. An alarming number of girls are entering puberty much earlier than normal. High concentrations of manganese found in soy-based baby formula can lead to brain damage in infants and altered behavior in adolescents later. In some places, like Canada and New Zealand, consumer groups have called for a ban on soy baby formula. In other instances, scientists and medical people have endorsed soy formulas as safe. If you choose to feed your infant soy formula, it must be organic and not GMO soy. Remember... mother's breast milk is always best if the mother is eating healthy. Raw milk from cows or goats not treated with rBST hormones can produce a great formula if breast feeding isn't a possibility. Often, infants who are allergic to pasteurized milk will have no problems with raw milk. So... what's the truth about soy? There are a lot of opinions and emotions surrounding the soy controversy. I think we have to use wisdom and common sense when reaching our own comfort level. These are my conclusions and recommendations should you decide to include soy products in your diet. Eat only organic soy products since at least 95% of soy crops have been genetically modified (GMO). Soy also has one of the highest percentages of pesticide contamination of any of our foods. Tempeh - made from partially cooked, fermented soybeans and formed into a cake or patty. It is a lowfat, high protein soy food with a firm texture and nutty flavor. Miso - a fermented soybean paste with a salty taste and buttery texture and is commonly used in miso soup. Natto - has a sticky texture, a strong cheese-like smell and a nutty, savory, somewhat salty flavor. Natto is the highest food source of vitamin K2. Tamari and soy sauce - both are made from fermented soybeans, though tamari is thicker, darker, and richer with a more complex, smooth flavor. Be aware that many cheap varieties of soy sauce are made artificially using a chemical process instead of being brewed from natural bacterial and fungal cultures; some inferior types contain MSG. 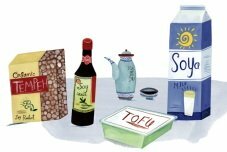 Note: Tofu is NOT a fermented soy product. Eat organic whole green soybeans (edamame) in snack-size portions. It's best to eat soy as close to its natural form as possible, since the greatest benefits come from consuming an isoflavone ratio close to that found in the whole soybean. Whole soy beans are much higher in genistein than the soy germ. Avoid taking isoflavone supplements made from the germ only - the isoflavone ratio is too skewed relative to the whole soybean. It's best to get your soy isoflavones by eating high quality soy foods. Avoid soy products that are highly processed or have questionable nutritional value. There have been thousands of new soy products introduced to the market in the past decade. Manufacturers are simply trying to capitalize on the soy craze and are putting out food that has little nutritional merit. Reduce your total soy consumption if your diet has been heavy on soy products. Eat the healthiest organic soy foods in moderation as part of a variety of dietary choices. Don't use soy as medicine by consuming large amounts or by taking isoflavone supplements for general use. I used to use unsweetened organic soy milk daily as the base of my breakfast smoothie. I've now started using organic rice, almond, and hemp beverages instead. I've also substituted fermented tempeh in place of tofu for many of my recipes. I will use it only to send you Holistic Wellness TIPS. Disclaimer: The information presented here is for educational purposes only. or medical concerns, please consult your personal health care professional.